Plast Pre-Cut sheet with the design of a typical 19th century Far West building. 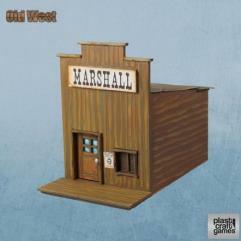 Designed for gaming tables based on the American Far West. Before assembling this product you will need to cut the connections that fix the different pieces to the PVC sheet. The properties of the foamed PVC sheet allows you to easily simulate wooden texture. The article is not assembled or painted. Assembly instructions are included.